SOURCE: The Way of the Master Evidence Bible, by Ray Comfort and Kirk Cameron, page 1529; ©2003 by Bridge-Logos Publishers. May I say, being born again is NOT an “experience.” Ray Comfort and Kirk Cameron wrongly understand being “born-again” as an EXPERIENCE that involves forsaking one's sinful lifestyle and “EMBRACING” Jesus Christ. Ray Comfort gets this idea from an errant understanding of James 2:19, “Thou believest that there is one God; thou doest well: the devils also believe, and tremble.” Many foolish Bible teachers misinterpret James 2:19 to mean that simple BELIEF on Christ is insufficient to be saved. This is not what the Bible is saying here. It simply means that no one is going to Heaven just because they believe there is a God. This is why Jesus told His disciples in Luke 13:23-24, “Then said one unto him, Lord, are there few that be saved? And he said unto them, Strive to enter in at the strait gate: for many, I say unto you, will seek to enter in, and shall not be able.” You can believe in God all you want—you can serve Him, go to church, tithe, sacrifice and do good all your life, and then go straight to the Lake of Fire forever to burn!!! Jesus said, “Ye must be born again” (John 3:7). What did Jesus mean by “born again?” The question is answered in John 3:6, “That which is born of the flesh is flesh; and that which is born of the Spirit is spirit.” When you were born the first time into the world, that was of the flesh; but the new birth (or second birth) is when the Holy Spirit of God comes inside your body to indwell you (upon your faith in the Gospel of Jesus Christ). Being “born again?” means that you have been born into God's family! Whereas all men are born spiritually DEAD from birth (Romans 5:15), in order to enter into the Kingdom of God a person must be born for the second time, spiritually (John 3:6-7). The first birth is PHYSICAL, earthly; The second birth is SPIRITUAL, by the Holy Spirit of God (John 1:12-14). In Mr. Comfort's thinking, being born again means moving from the realm of merely believing in God, to the realm of leaving one's sinful ways and clinging to Christ. Mr. Comfort recognizes this as an EXPERIENCE, which to him means being born-again. The Word of God teaches something entirely different. A person is “born again” by the Holy Spirit of God, which is initiated by mere childlike belief in Christ's death on the cross for our sins, His burial and resurrection three days later. The Bible defines this as the “Gospel” in 1st Corinthians 15:1-4. Whereas The Evidence Bible teaches that a transforming “radical experience” is what it means to be born-again; the Holy Bible teaches that it is the transforming power of God's Holy Spirit that produces the new birth . . . It is a false plan of salvation to explain the new birth as a mere transforming experience. Any radical transformation is wrought solely by the Holy Spirit of God. It is heresy to require an experience, a radical change, or some transformation from a person in order to be saved. This is because eternal life is a free gift (Ephesians 2:8-9). Salvation is a TAKE proposition, not a GIVE proposition. God will not save anyone who is trying to be saved, He will only save those who are trusting to be saved. It is the presence of the indwelling Holy Spirit that changes a person, and not our own human effort. Although a person may or may not express emotions at the time of salvation, emotions are not required for salvation. Neither tears, nor any outward manifestation of inner changes, nor a desire to serve God, nor forsake sins, nor any radical experience is necessary to receive the free gift of eternal life. IT IS A GIFT, and a “gift” is free in every sense. For a wonderful presentation of the simple plan of salvation by Pastor Hank Lindstrom (1940-2008), please see Get God's Gift. Furthermore, forsaking one's sinful lifestyle is NOT what it means Biblically to “repent.” Repentance is “changing one's mind,” that is, realizing and acknowledging one's guilt of sin for breaking a holy God's commandments (Romans 3:19). The only thing you need to repent of to be saved is whatever has been hindering you from coming to Christ to be saved (Hebrews 6:1). The man who BELIEVES the Gospel has repented, otherwise he never would have come to Jesus Christ to be saved (John 3:20). Our part in salvation is simply to BELIEVE on Jesus Christ, and whatever else is a part of our salvation is solely God's department, and you can be assured He will attend to that. I have nothing personal against Ray Comfort nor Kirk Cameron. I am a born-again Christian and a Baptist preacher. As such I am simply contending for the Christian faith as Jude 1:3 commands us all to do as believers. It concerns me when I hear Bible teachers who don't truly understand the Bible, teaching that the new birth is merely a radical transformation caused by turning away from sinful living and embracing Jesus Christ. That's not the Gospel. That's not salvation. That's not the new birth. That's reformation!!! I am 100% convinced that Ray Comfort is not a genuine Christian. The Way of the Master Evidence Bible has much good information in it, but if they are wrong on salvation, they are wrong on everything. It's like buttoning a shirt, if you get the first button wrong, then all the buttons will be wrong. Ray Comfort and Kirk Cameron have a wrong grasp on what it means to be saved. According to the quote I provided to you from The Evidence Bible earlier, they understand the new birth to be a descriptive term used by our Lord to describe the “radical experience” of forsaking sinful bad habits and embracing Christ. May I kindly say, the term “born again” does not refer to having a “radical experience.” That's not why Jesus used the term. To be “born again” means to have He (Christ), Who is the beginning (Revelation 1:8), born in us. Jesus taught Nicodemus (a Jewish religious leader) that to enter into the Kingdom of God, a man must be born of both water (the physical birth) and of the Spirit (the spiritual birth). Jesus said, “Ye must be born again” (John 3:1-7). Ray Comfort places the emphasis upon AN EXPERIENCE, which is produced by forsaking sinful living and embracing Christ; but the Bible places the emphasis upon THE GIFT OF ETERNAL LIFE, which is produced by believing the Gospel of the Lord Jesus Christ. The great spiritual danger of teaching the new birth as “AN EXPERIENCE” (let along a “radical” experience) is that people will think they must have “an experience” to get saved, and that's not true. When you believe (fully trust) the Gospel (Good News) of Christ's death on the cross, His burial and bodily resurrection three days later, you are saved. When you get saved you won't feel any different inside. When I got saved I didn't see stars, angels or hear heavenly voices. The presence of the Holy Spirit is that still, small, quiet, voice of God . . . I love that! The prophet Elijah looked for God in the wind, the earthquake and in the fire, but God came to Elijah in A STILL SMALL VOICE. That is always where you will find God my friend. Turn off the TV. Turn off the radio. Put down the electronic toys. 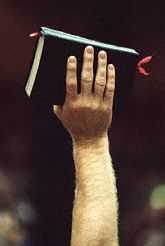 Pick up the Holy Bible and let God's Holy Spirit speak to your heart in that precious STILL SMALL VOICE. I could never recommend The Evidence Bible to anyone, because it is misleading concerning the plan of salvation. Mr. Comfort also butchers Matthew 7:21-23. I admire Ray Comfort in many ways as an aggressive street evangelist, and he has so much potential to become a great preacher, but he needs to forsake Lordship Salvation and proclaim the gift of God instead. A gift is a gift is a gift! It's not that hard to figure out. Those are some very dangerous words at the end, “…assuming that they are safe just because Jesus died on the cross.” Are not all believers “safe” in Jesus Christ? Yes, they certainly are safe (Ephesians 1:13; Isaiah 28:16; Romans 10:11); but Ray Comfort teaches they are not. Ray Comfort does not fully understand the Biblical doctrine of the IMPUTED righteousness of God (Philippians 3:9; Romans 10:3-4). Ray Comfort is teaching heresy to say that believers who fail to forsake their sinful living are not safe in their salvation. Such reasoning places a heavy burden upon the sinner, requiring one to depart from sinful bad habits as a prerequisite to be saved. This is human effort added to God's simple plan of salvation. First of all, no one can repent of all their sins. Even the best Christians still commit sin every day, both in deed and thought. It is a sin even when we fail to pray as we ought (1st Samuel 12:23). Check what I say and you'll discover that it is true, that... Mormons, Seventh-Day Adventists, Jehovah's Witness, John MacArthur, Paul Washer and Ray Comfort all define repentance THE SAME wrong way. They all mistakenly define repentance as ceasing from a sinful lifestyle and surrendering one's entire will to Christ's Lordship as a requirement to be saved. If a person professes faith in the Lord Jesus Christ, but still hangs onto their sinful bad habits, they are wrongly accused of never having repented and are said to still be unsaved. Thus, salvation requires some degree of human effort with all these aforementioned religious cults and false prophets. Ray Comfort and Kirk Cameron totally fail to grasp the reality that eternal life is a FREE GIFT (Romans 5:15,18). Ray Comfort teaches a performance-based plan of salvation; whereas, the Bible teaches that eternal life is a GIFT. Romans 6:23, “For the wages of sin is death; but the gift of God is eternal life through Jesus Christ our Lord.” Being born-again is not an experience; but rather, it is a supernatural miracle of God in response to a person's faith in the Gospel message. The Holy Spirit of God comes to indwell (live inside) the body of every believer the moment they receive Jesus as their Savior (John 1:12; Romans 8:9; 1st Corinthians 3:16-17). The “new birth” refers to the Spirit of Christ which comes to indwell the believer (Romans 8:9). If you're born once, you die twice; but if your born twice, you die once. Although we must all die a physical death, the second death is only for Christ-rejecters who die in their sins (Revelation 21:8). Anyone who realizes they are a sinner in God's eyes, and believes the Good News of Christ's death on the cross for their sins, and that He was buried and raised up bodily after three days, is immediately saved and has eternal life. Salvation is received, not achieved. Eternal life is a gift, and a gift need only be taken. To receive a gift there can be no obligations, requirements, prerequisites nor strings attached. Salvation is not doing your best, it is having Christ's best put to your account through receiving Him by faith.